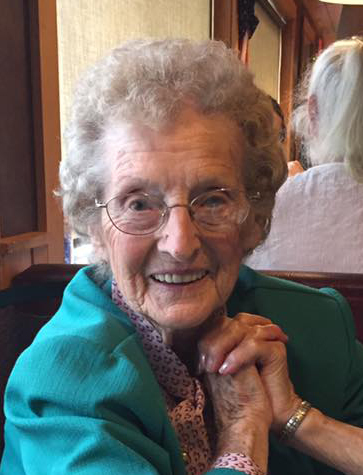 Christine Emma (Gurney) Beaulieu, 96, passed away peacefully in her sleep at her daughter Patricia’s winter home in Wagener, South Carolina. She lived in Fairfield, Maine with her daughter, Judith. Born on March 23, 1923 in Shawmut, Maine to Otis and Gelie Gurney, Christine attended Fairfield schools, graduating from Lawrence High School in 1940. In December of 1943, she married Harold Works and they started their family immediately with the birth of their son, Gordon, in September of 1944. Sadly, Harold’s life was taken shortly afterwards while bravely serving our country in World War II. In October of 1946, she married Joseph (Fernando) Beaulieu. They had four more children and raised their brood of five in a beautiful old house in the center of Shawmut, Maine. Christine was a full-time homemaker, working part-time when needed at the Keyes Fiber Pulp Mill just down the hill from their home. She was a member of the Immaculate Heart of Mary Church in Fairfield until its closing; after which she attended Notre Dame in Waterville. When her children were growing up, she was famous among their friends for the two glass cookie jars on her counter; (one containing home-made chocolate chip cookies, the other containing home-made ginger snaps); and the cake dish under the counter that held the cherished whoopie pies. Each container was replenished every Saturday morning and all who entered her home were welcome to them. In her younger years she was an avid bowler and a long-time member of the Shawmerettes. Though they were homemakers from a tiny town, they were a force in the Waterville bowling league, winning many trophies throughout the years. Christine and her husband, Fernando; married 55 years before his passing in 2001; built their camp on Sibley Pond in Canaan in the summer of 1953 and enjoyed watching their children and grandchildren learn to fish, swim, waterski and sail for many years to follow. They also loved to travel and cherished their time spent each summer at Acadia National Park where they rode bikes, picked blueberries and hiked all the trails around the park. She loved to sew, knit, and crochet. In recent years, she must have knit hundreds of preemie hats that were donated to hospitals near and far. There are many of us who hang our clothes on hangers she hand-tied with yarn; or we wear a pair of her hand-knit mittens. Christine lived with her daughter, Judith, during the spring, summer and fall where she adored visits from her great-grandchildren and looked forward to taking everyone’s money at the weekly Wednesday night card games. She spent the winter months with her daughter Patricia in South Carolina where her “Southern Gals” would take her along on their weekly escapades to Antique Shops and out of the way diners. She also got a huge thrill whenever she could clobber her opponents in Words with Friends. Christine was predeceased by her parents Otis and Gelie Gurney, husband Joseph F. Beaulieu, brother Omer Gurney, and sister Ruby Harding. She is survived by her sons Gordon (Cindy) Works of Benton, Maine and Stephen (Donna) Beaulieu of Clinton, Maine, daughters Patricia (Roger) Cole of Canaan, Maine (and Wagoner, S.C.) Judith Pelotte (Ron Harris) of Fairfield, Maine and Virginia (Paul) Raye of Detroit, Maine; sisters Emerline Bartley of Shawmut, Maine and Earline (Stanley) McGoff of Shawmut, Maine; Sisters-in-law Geraldine (Leo) Goulette of Waterville, Maine and Marguerite Beaulieu of Riverview, Florida; grandchildren Darrell (Laurie) Works, Dwayne (Deanna) Works, Jeffrey Parish (Nancy Smith), Michael Parish, Anthony (Tara) Pelotte, Andrea (Bert) Temple, Binica Beaulieu (Todd Carter), Arica (Shawn) Burwood and Holly Raye (Corey Kelley). Christine is also survived by 20 great-grandchildren (with one more due in July), many very special nieces and nephews and several bonus grandchildren and great-grandchildren whom she cherished as dearly as her own. Arrangements for her funeral and burial will be announced at a later date.